Often, yellowing concerns a reaction with phenols. This we call ‘phenolic yellowing’ or ‘gas fading by NO2′. These phenols are present in packaging materials. Under certain conditions contact with the textile causes yellowing. When this type of yellowing is discovered in an early stage, the process can still be reversed. 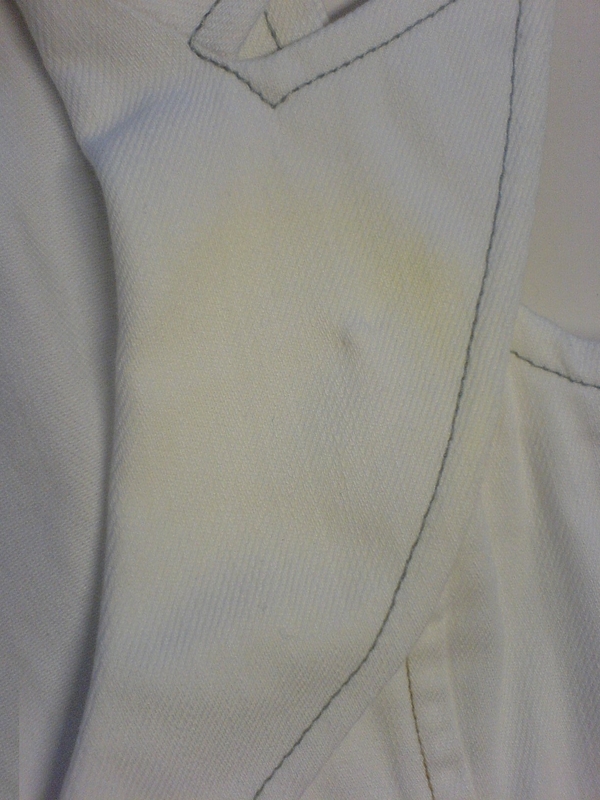 Which textiles have a propensity to yellowing Basically, in all textiles (and all colours) yellowing/discolouring is possible, but it is specially visible in the very light colours, so white and pastel colours. In the darker shades you can only see the colour getting a bit duller. Where and when does it happen ‘Phenolic yellowing’ is mostly occurring when storing fabrics or garments, so in the warehouse. Plastic packaging material, like polybags, can contain BHT (butylated hydroxy toluene). This is an antioxidant that prevents ageing of the plastic. This BHT can be transferred to the fabric. Also from carton boxes a phenol (derivate) can be carried over to the textile. It can react with the nitrogen oxide (NOx) in the air and forms nitrobenzenes or quinone (or chinone), which is a yellow chemical substance. The process needs alkaline (so non-acid) conditions. A cause of alkaline conditions can be insufficient washing out and neutralising of chemicals used for bleaching and dyeing. More about ‘phenol’ For general information see en.wikipedia.org/wiki/Phenol and for more technical details, see: Toxic Substances Portal. 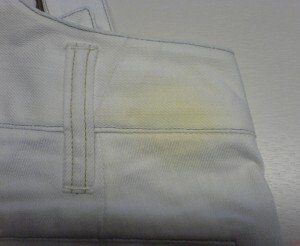 There are tests that indicate the risk of yellowing of fabrics. Put the right test standard and requirement in your specifications, e.g. in the material requirements. Already for a long while the so-called ‘Courtaulds method’ exists, which is a quite expensive method. From 2007 the method is standardised in an international standard. Convenient. For a maximum effect, make sure the required value is realistic and common in trade. Also requirements of packaging materials are possible. Q&A Quality Assistance can assist you. For more information contact Chris Koeleman, per e-mail (c.koeleman@quality-assistance.nl) of by phone: +31.6.443 98 216 or Linkedin). Be aware though that my services are of a commercial kind. Any feedback to this article is welcome. If you have an opinion about it, something is unclear, or you have discovered an error, please inform me.